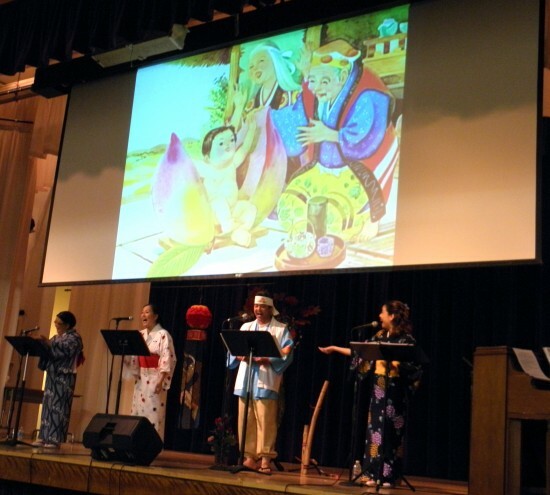 The Grateful Crane Ensemble presented a sing-along event, “Natsukashi Melodies,” on Aug. 26 at Nishi Hongwanji in Little Tokyo. The audience was provided with lyrics, along with English translations. Singers Haruye Ioka, Keiko Kawashima, Kurt Kuniyoshi and Helen H. Ota, with Scott Nagatani on piano, performed a variety of songs that Japanese Americans learned from their parents and grandparents, including “Furusato” (Home), “Usagi to Kame” (The Rabbit and the Turtle), “Haru ga Kita” (Spring Has Come), “Hana” (Flowers), “Suzume no Gakkou” (The Sparrows’ School), “Akatombo” (Red Dragonfly), “Yuyake Koyake” (Sunset), “Shojoji no Tanuki Bayashi” (Badgers’ Jamboree at Shojoji Temple), “Momotaro” and “Urashima Taro,” the latter two based on well-known children’s stories. 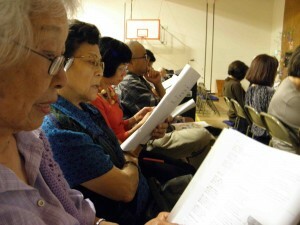 The show will be repeated on Saturday, Sept. 22, at 3 p.m. at Orange County Buddhist Church, 909 S. Dale Ave., Anaheim. Admission is $25. For reservations, call (310) 995-5841.